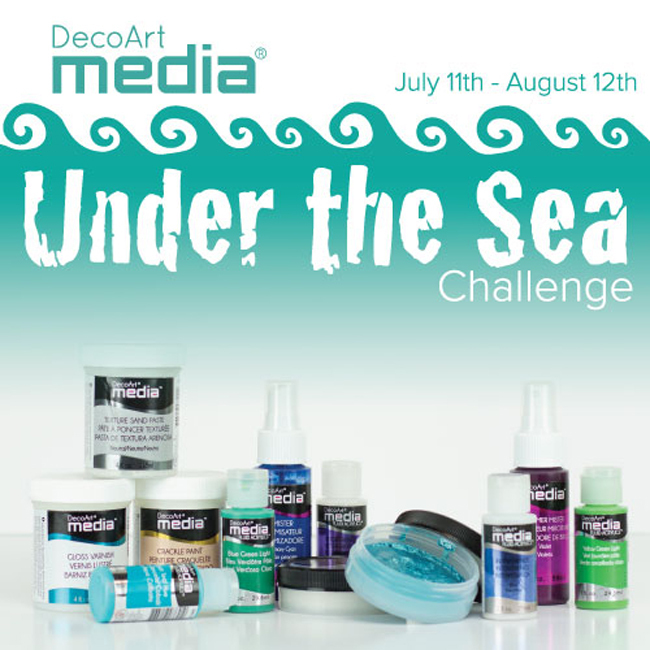 I am participating as a DecoArt Mixed Media Design Team Member (DMMDT) in their summer challenge 'Under the Sea', you are invited to submit a project up until the 12th August and there are two fabulous media packages to be won. 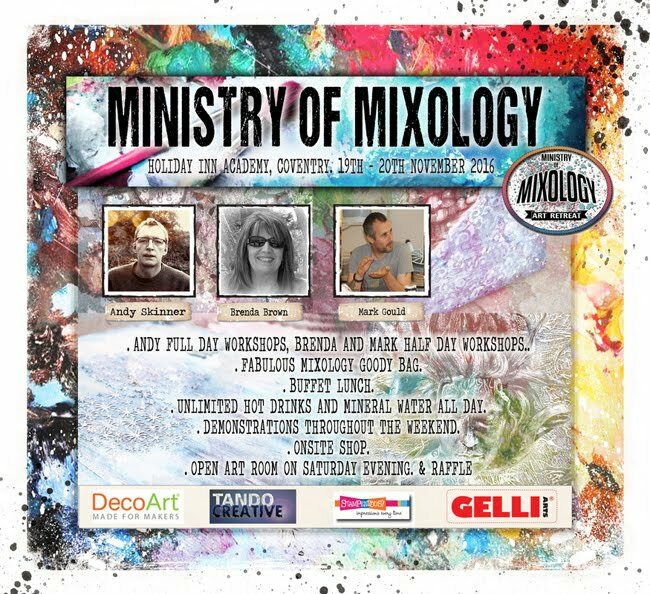 So get your DecoArt supplies out and get your thinking caps on, this is one not to be missed. I have had some fun with a cheap Ikea frame for this one. 1. 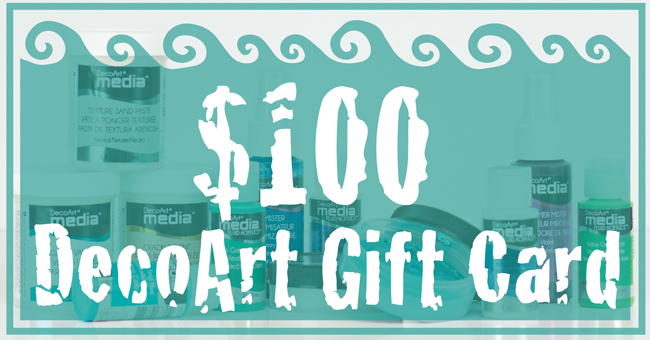 Give your frame a coat of white gesso and dry. 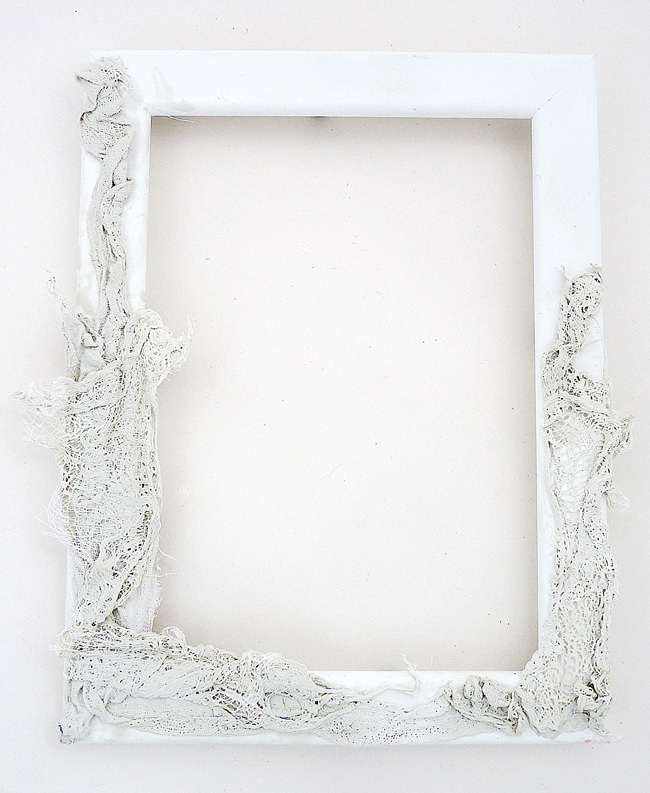 Take some muslin and cheesecloth and adhere to the frame with a fabric structurizer (I used one I have in my supplies but DecoArt do a fabric stiffener you could try). Leave to dry. 2. Cut your card to fit the frame and give it a coat of white gesso. 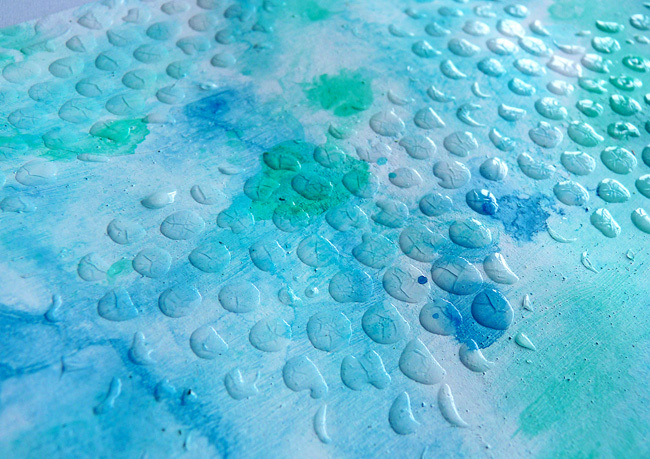 Mix some transparent/semi transparent sea blue and greens with water separately on a craft mat and dip and dry your background several times keeping the wash very light in colour. 3. 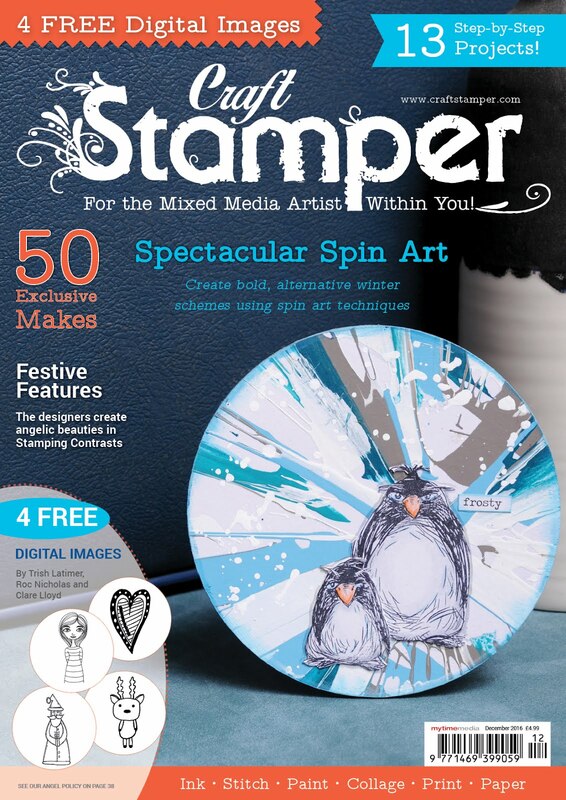 Use a bubble like stencil with transparent crackle glaze and randomly add sections to the background. Leave to dry. 4. Take a piece of card and brayer red, orange and yellow paints over the surface both horizontally and vertically and finish with a brayered wash of yellow oxide. 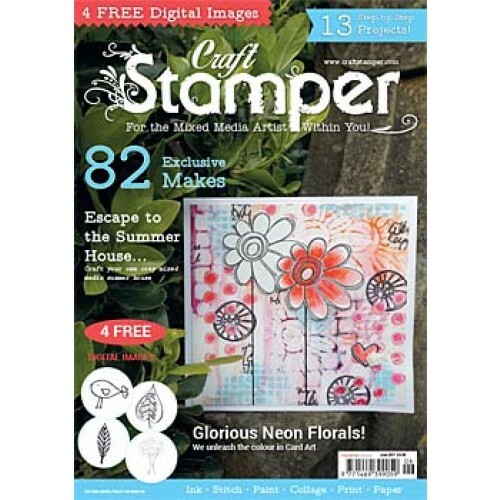 Use a crackle stamp with red geranium archival ink and when dry die-cut flowers. Because they looked deeper than I wanted I dipped them in a watery titan buff and dried them. 5. 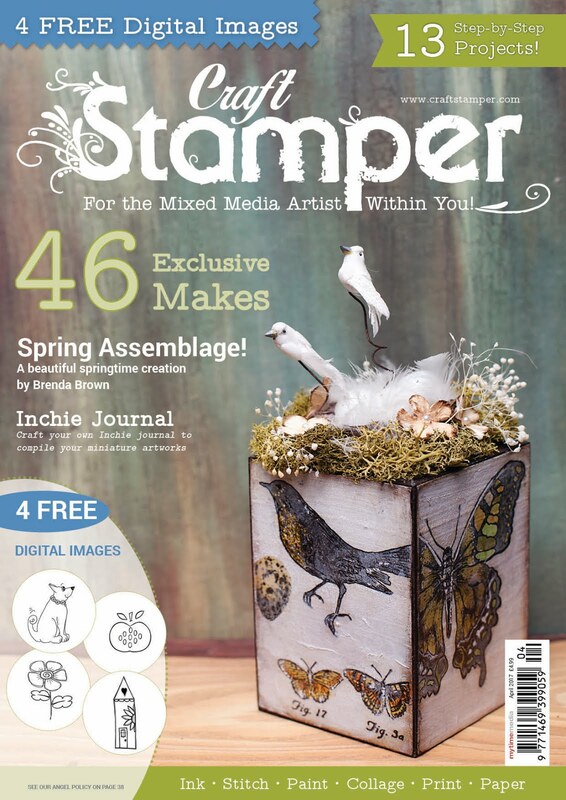 Make another piece using greens and brown (without the crackle stamping) and cut foliage. Again I knocked the pieces back by dipping in watery titan buff. 6. Adhere glass flat backed cabochons to the background. 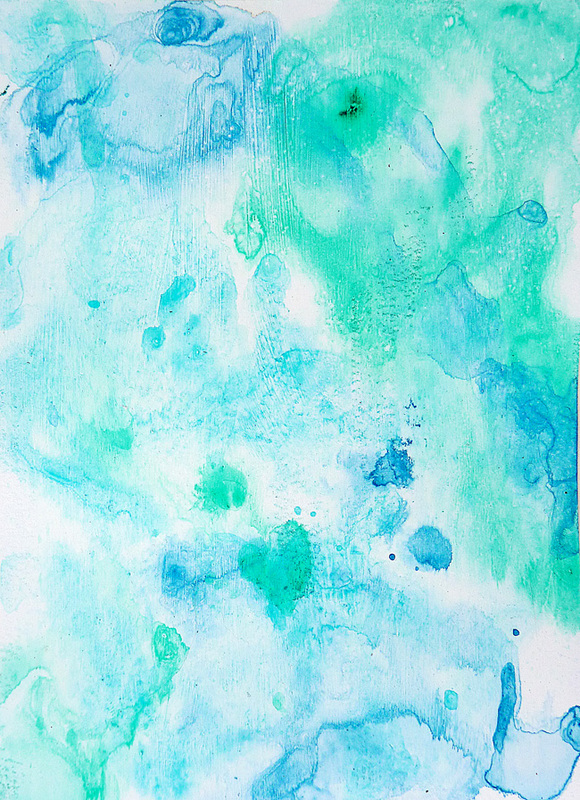 Make more colour washes in the blue/greens and then drip and spritz with water. Repeat layers as necessary to achieve required results. 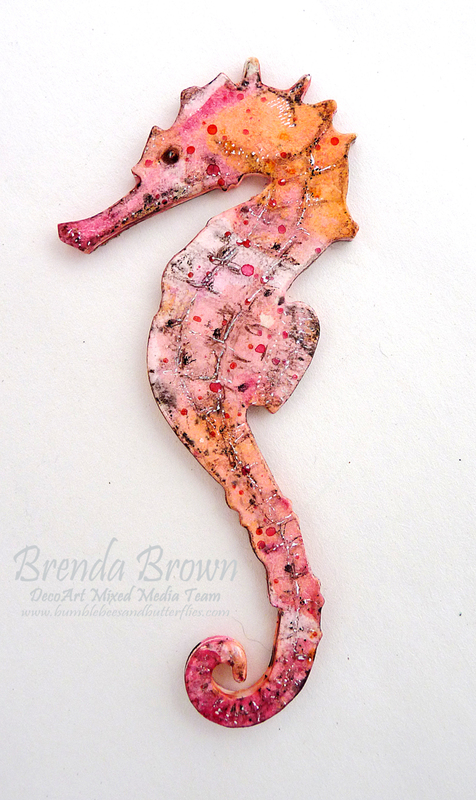 8. a) Die cut two seahorses from mount board and glue them together, dip in tiny amounts of pyrrole red and cadmium orange with water, seal with a coat of matte medium. b) Draw on markings with a ground espresso distress marker, c) then spritz lightly to move the distress ink around a little and seal with micro glaze. d) I spritzed again to check it was sealed but it wasn't fully and more ink moved around so I dabbed it off and re-drew in a few parts of the seahorse and sealed it again. e) To finish I splattered with some of the pyrrole red and quinacridone orange and used a posca white and a posca black pen to draw in a few dots and details. 9. I didn't like the eye in the last photo so I played with it a bit more and now I'm happier with it (although he doesn't look as angry irl). Right after that marathon onto more of the frame. 10. a) When the fabric is dry on the frame adhere glass glitter and micro beads to the fabric using matte medium. 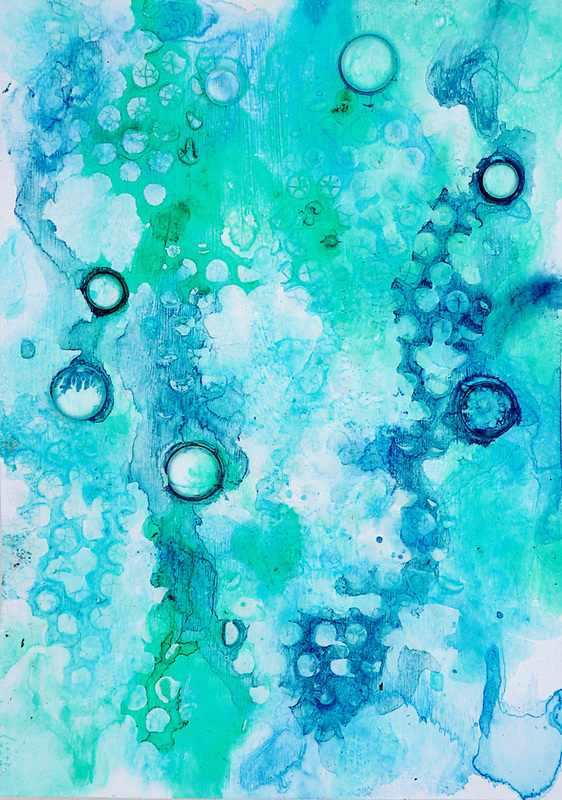 b) When dry splodge translucent blue and white paints over, spray with water mister and dry - you will need to repeat several times all around the frame. c) Again when dry spray perfect pearl sprays and dry again. This time add in some brown and yellow colours. 11. Knock back the deeper colours by splattering translucent white paint and by adding some snowtex. 10. 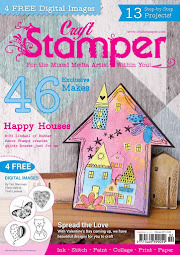 Take the fun crab chipboard piece, add sand texture paste and dry, then stipple sandy colours and brown over him. 11. The other embellishments also had a bit of a make over including the starfish and shells that are real. 12. Give everything a spray of Americana matte sealer and finally put the frame together adding some knotted string and raise the seahorse to give it added dimension. I hadn't added the title of the piece on this photo but I am really pleased with the effects. 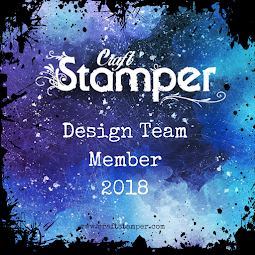 I hope you have been following the team and their projects this month, so do pop over to the Media Blog to see what they have been creating AND look too at what you could be in with chance of winning if you join in. Many thanks for stopping by Bumblebees and Butterflies and checking out my Under the Sea frame. I also notice that Anything but Cute has a Summertime Fun challenge going so I thought I would enter it there too. No better fun than being by or in the sea. So then I thought let's have fun with anymore challenges I could find and Mixed Media Mojo has Summer Fun with a twist of Shells. BEAUTIFUL. Your project just feels so light and airy and clean Brenda - makes me totally just want to DIVE in and play in the LUSCIOUS water, CATCH some of the SPLENDID bubbles and DANCE with your LOVELY floating flowers and take a RIDE on your GORGEOUS sea horse. Wouldn't that just be so fun!!!??? XXj. Oh Brenda, I can't express with words how I love this under sea scene!!! Your seahorse is amazing! But every detail on your frame is brilliant! You showed us many great technique! 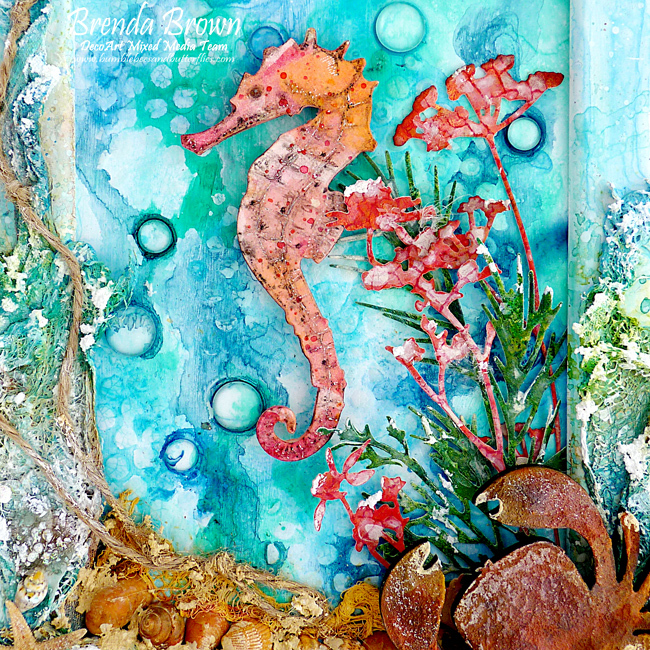 A stunning project Brenda, you have created an awesome under the sea scene. Brilliant...Brenda!!! Your seahorse is amazing!!! Such beautiful hues and lovely composition. Brenda, I've been away for awhile and now what a lovely under sea canvas to come home to! 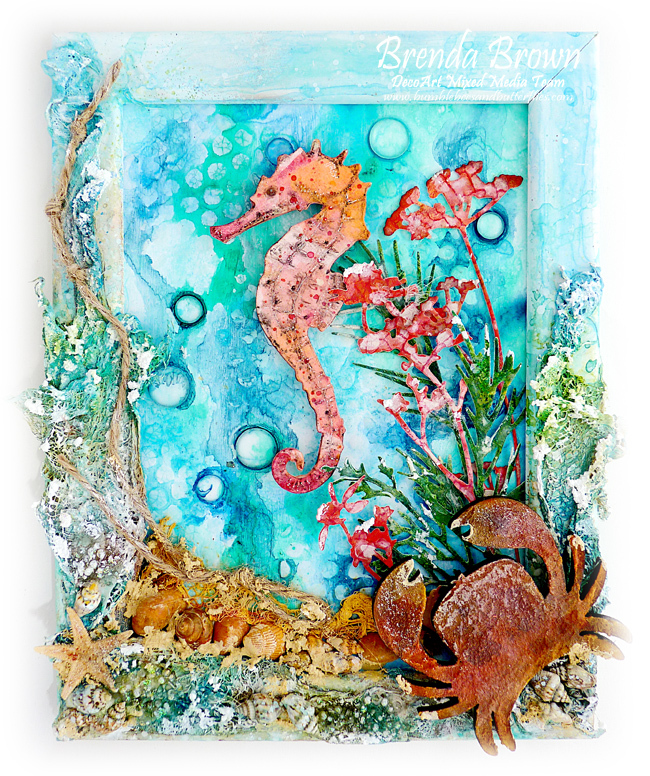 I love your watery background and that gorgeous seahorse! I can't believe you drew in his markings--looks so realistic! Great texture on the frame, too! 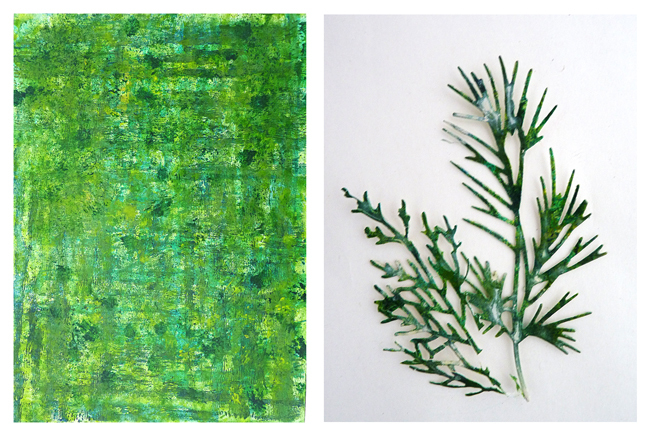 Love this,and think you should enter into Frilly and Funkie's sea themed challenge! Thank you so much for the inspiration! Big hugs! Wowza! Utterly gorgeous . Thanks you so much for sharing the development of this incredible deep sea delight! Absolutely fantastic, Brenda! I always hesitate to buy that seahorse die but now I have to have it! Love everything about this project! 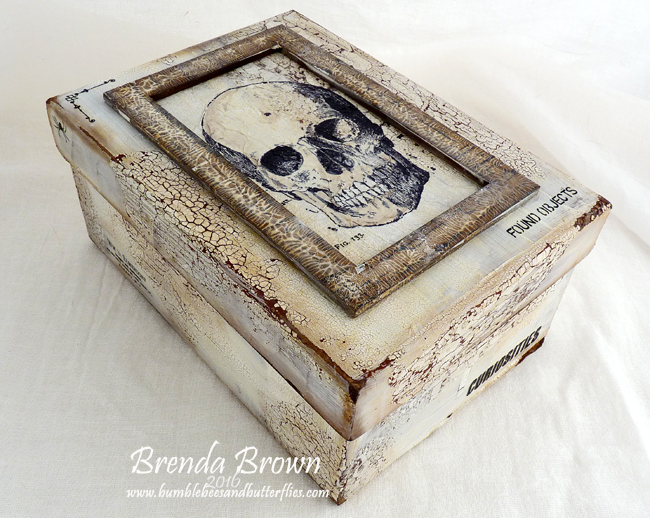 Brenda, this has to be one of my all time favorite pieces! I loved your wonderful tutorial to see how you achieved such amazing texture and color. I would love to touch it as well. Love, love, love! I love this!!! Really pretty! Wow Brenda what a jaw dropping project. The details and layers are incredible. Your crab and Seahorse are amazing. Love, love, love. holy Brenda this is amazing!!! and the step outs , the details and the photos are fantastic! I think the word stunning was invented just for this creation Brenda! Fabulous! I love the details! The sea-horse texture is gorgeous! You feel like you are snorkeling and seeing all the treasures on the sea floor. 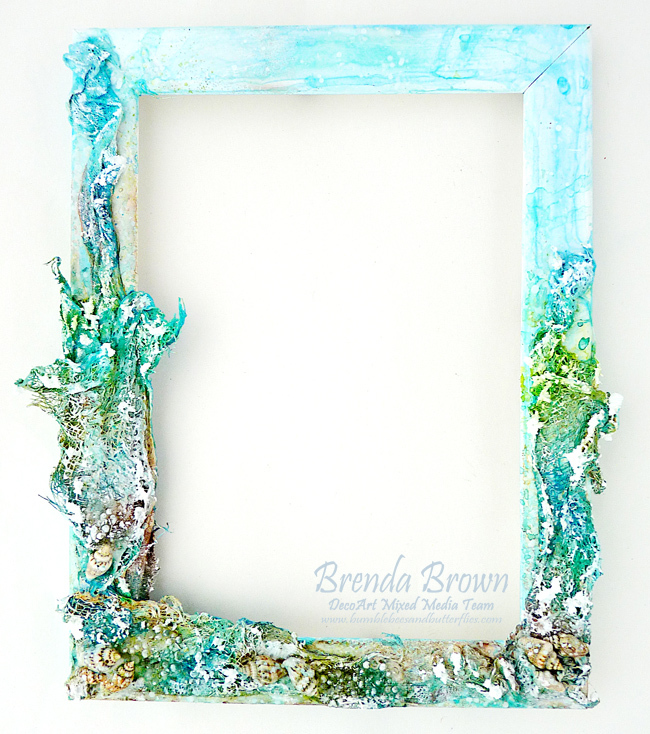 A stunning Under the Sea frame Brenda, loved the step by step processes. An AMAZING project! Soo beautiful in every detail! This is a FABULOUS project... Can't stop looking at all the details and colours, everything is so perfect and BEAUTIFUL. Wow, wow and WOW!!!!! 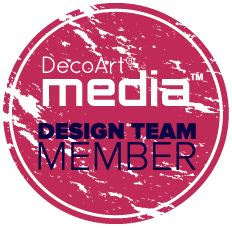 You do always amazing art, and your artworks for DecoArt are just a pure delight! OMG, Brenda, this is an utterly stunning summery project! All I want to do is to touch those fantastic textures you have managed to achieve! I am keep styding your photos of this exquisite masterpiece of art! I am simply in love with this absolutely beautiful canvas! Wow! 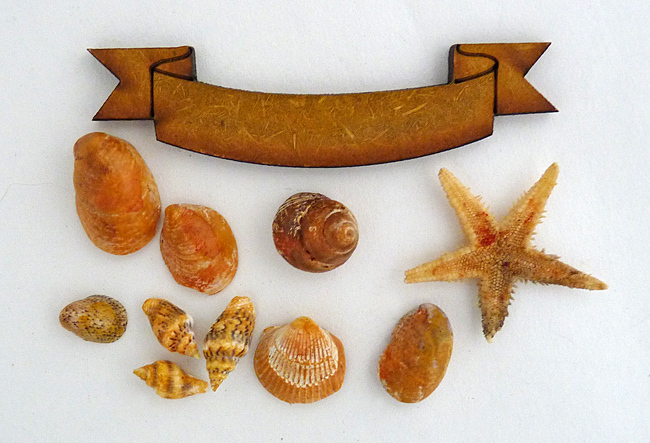 This is a true treasure trove of seaside beauty! There is so much wonderful texture here that I am just drawn right into the frame. 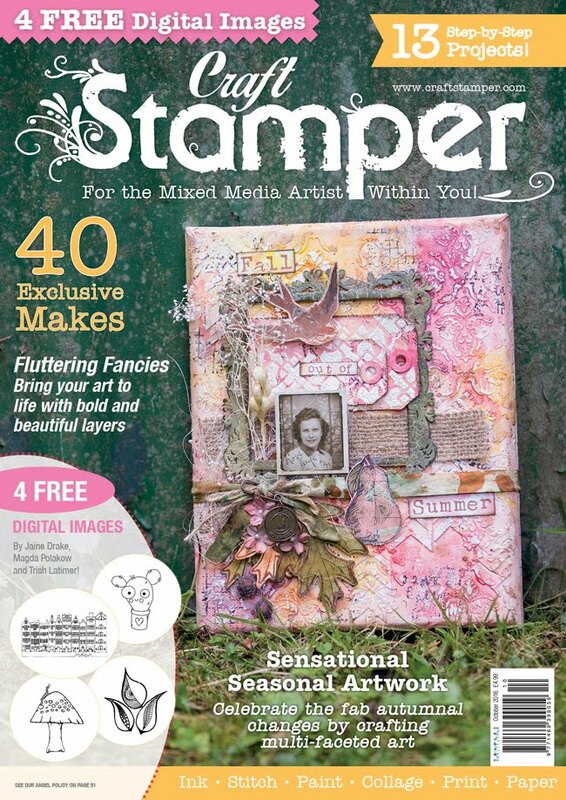 I love, love, love the vivid colors and whimsical images...and that crab is such a fun addition. Your seahorse is stunning! 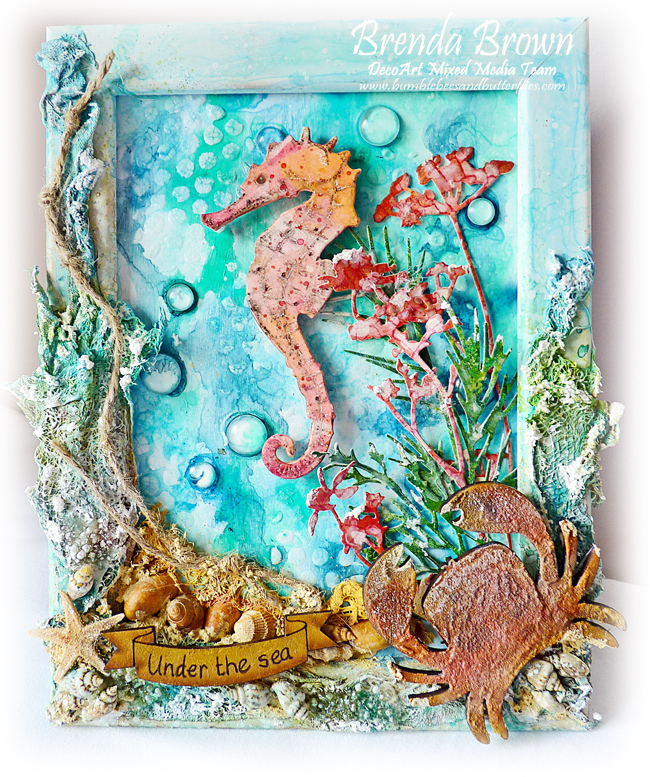 Thanks so much for sharing with us at the Frilly and Funkie "By the Sea" Challenge! 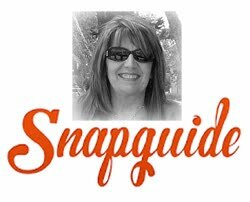 What a gorgeous work of art, Brenda! There are too many lovely details to count! The texture and palette are over the top fabulous! 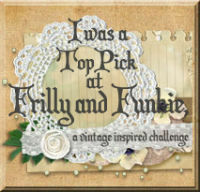 Thank you so much for joining us at the Frilly and Funkie Challenge! A big round of congratulations on all your wins for this wonderful work of art! You did an awesome job on your framed, sea themed art piece. 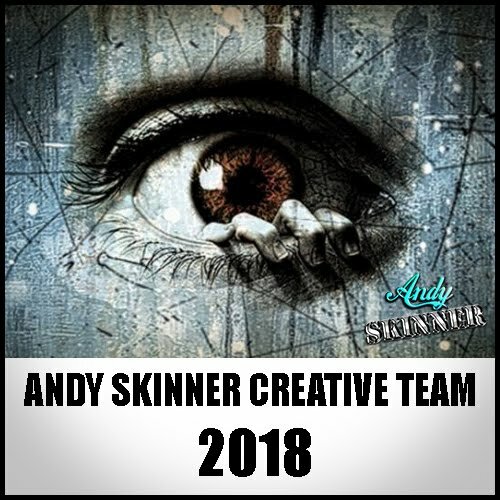 You gave us very detailed instructions along with some great photos, so that most of us feel like we could achieve this great outcome, as well. 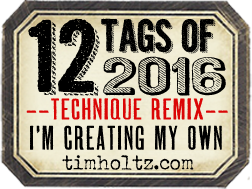 Well worth the effort and many thanks for taking the time to share this inspiring piece!